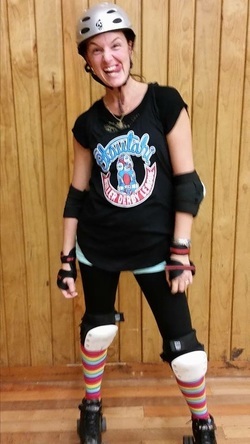 Wicked Weasel - Christchurch Roller Derby. Strong City. Stronger Skaters. What's the meaning behind your name/number? The one that stuck after a night of drunken debauchery where everyone was coming up with names one worse than the other and none I could admit to in front of my chiddlers. It was either that or Scandilush and Wicked Weasel is an old nickname that'll suit my player style. What is your biggest accomplishment? What is your signature dance move? You name it, when the music starts I can't stop. Would you rather fight 100 duck sized horses? Or 1 horse size duck? Check out Suzy T's Photography on Facebook! All images on this website subject to copyright.